Papua Explorers Resort is located in the islands of Raja Ampat, which is on the northwest tip of the Bird’s Head Peninsula of West Papua. Raja Ampat translates into English as the Four Kings and gets its name from a local mythology about four kings that occupy the four big islands; Salawati, Batanta, Waigeo and Misool. Its a stunning archipelago comprising over 1,500 small islands, hosting thousands of species some of which are endemic to the region. Some scientific surveys reveal that Raja Ampat has 603 hard coral species which represents more than 75% of all the species in the world. With its rich ecosystem and abundance of species, Raja Ampat is the bull’s-eye of the Coral Triangle in every sense. Papua Explorers is located on the island of Gam and just along the coast of the world-renowned Dampier Strait, only 10 to 15 minutes away from the most famous dive sites like Manta Point, Cape Kri, Manta Sandy, Blue Magic and more. Papua Explorers Resort has been built using traditional Papuan construction methods and local, natural materials. The water bungalows are designed to be in perfect harmony with the exotic surrounding, allowing the guests to feel the breeze from the rainforests, enjoy the songs of the tropical birds and soothe their souls with the flutter of the waves. The 300m2, over-the-sea restaurant and lounge is designed to offer a relaxing environment to enjoy various international and local dishes from the restaurant and to refresh and relax between the dives. The little peninsula that Papua Explorers Resort is located on is home to the endemic Red Bird of Paradise. 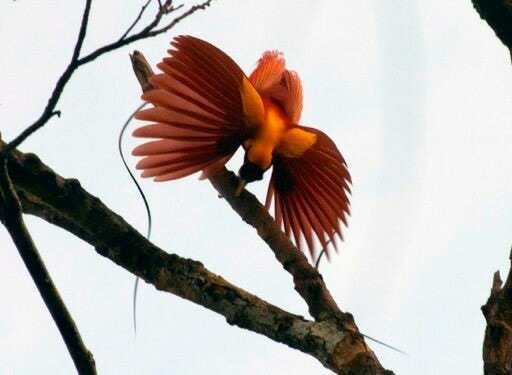 This unique bird and its mating ceremony can be observed after an early morning hike in the rainforest. There is a pretty lake behind the resort that can be reached after a five-minute hike in the jungle. This short jungle hike is an excellent way to observe the amazing plants and creatures of the rainforest. o-seater sofa and a coffee table. 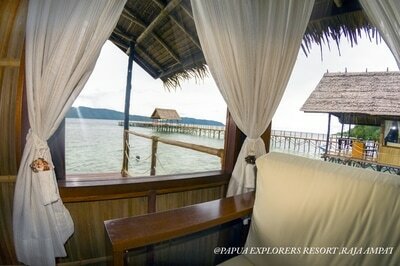 There are two sun loungers on each veranda as well as a hammock to enjoy the breath taking Raja Ampat sunsets. There is a stairway straight to the ocean on the veranda. Towels, shampoo, shower gel and soap are provided. Raja Ampat waters are highly rich in nutrients and Dampier Strait is especially nutrient-rich due its fast moving currents. These currents attract a wide variety of species including migrating mammals and pelagic species. However, nutrient-rich means low visibility and the saying goes “no current, no fish”. The dive center distributes reef hooks to all divers. All divers are required to bring their own safety buoys and whistles with them. It is mandatory for all divers to have diving insurance to be able to dive with Papua Explorers. The closest recompression chamber is in Manado and the costs for transportation can be extremely costly in the event of an emergency. Therefore all dives are planned and executed without deco stops and it is mandatory for all divers to use a dive computer. There isn’t a huge stock of rental equipment because most divers prefer to bring their own equipment here. So if you’d like to rent any equipment from the dive center, please book 60 days in advance. 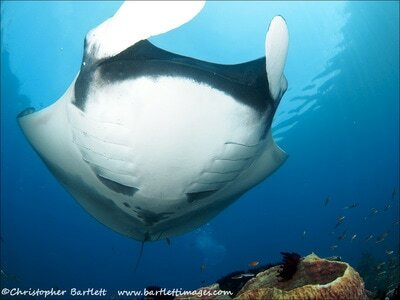 Raja Ampat is an underwater photographers’ heaven for both macro and wide angle photography. Huge corals in vibrant colors are perfect for wide angle. Most photographers are mesmerized by the density of fish and corals and focus on wide angle photography throughout their stay. 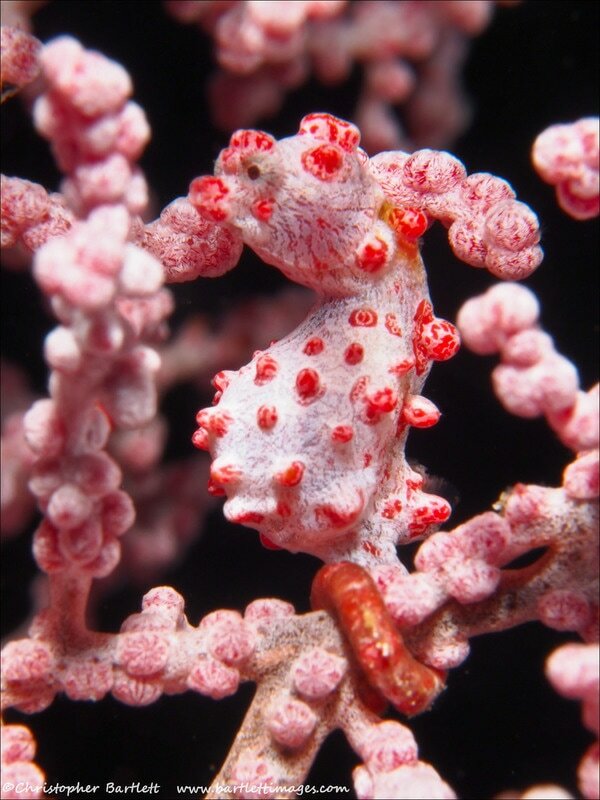 However, Raja Ampat is home to some endemic macro creatures and using your macro lens can be extremely rewarding. Photography is not limited with underwater. Tropic birds, bats, moths and butterflies, interesting rainforest creatures can be observed on the island, as well as wild orchids and endemic black orchids. If you are interested in photographing the Red Bird of Paradise, it is advisable to bring a tripod and telephoto lens with you. Should you be interested in visiting the neighboring village, be prepared to capture portraits of beautiful Papuan children. Raja Ampat islands are amongst the rarest natural beauties in the world. Mushroom islands and the depth of green melting into the bright blue of the sea will make you feel like you’re on Pandora in James Cameron’s Avatar. Excursions to the mushroom islands are highly recommended. If you are interested in bird watching, then it is guaranteed that your stay in Papua Explorers will be a very satisfactory one. We wake up to the amazing sounds of the tropical birds. Flocks of parrots can be observed during the day. Red Bird of Paradise is resident at the neighboring bay. If you’re not into scuba but interested in the marine life, then snorkeling is ideal for you. It is possible to witness a serious amount of the marine and coral reef life by snorkeling as well. Guided kayak tours are available upon request at an extra charge. Ujung Pandang- Sorong: There are international flights to Ujung Pandang from Singapore & Kuala Lumpur. This option requires one night stay in Ujung Pandang. Manado-Sorong: There are direct flights to Manado from Singapore and Kota Kinabalu (AirAsia). This option requires one night stay in Manado. There are airport hotels in Jakarta and Ujung Pandang. Rooms can be booked for 6 hours upon request. Airport hotel in Jakarta is located on the second floor of Terminal 2, between gates D and E. Hotel can be accessed after going up 1 floor with the escalator. The airport hotel in Ujung Pandang is located on the 2nd floor, right in the middle of the terminal. Transportation in Indonesia is a growing and improving sector, however the standards are still way below the western world. Therefore, it’s important to mentally prepare yourself for the imperfections you may face during your travel. Be patient and stay positive, remind yourself that you will be in a divers’ paradise soon. We would highly recommend that you have travel insurance to cover any potential loss caused by the airlines. Don’t forget to lock your luggage and housing cases. Airplanes can be extremely cold on domestic flights. We recommend that you have a jumper with you. Domestic airlines can be quite tolerant about over weight issues occasionally. The cost for extra luggage is usually around USD3-4/kg for Jakarta-Sorong flights. Papua Explorers Resort has scheduled transfers to the island from Sorong every Sunday and Wednesday with their own boat. The boat leaves at 12:00 at noon and we strongly recommend guests to arrange their flights to arrive earlier than this. In the event of guests not being able to connect to these transfers, special transfers can be provided at an extra cost. Scheduled boat transfers leave at 12:00. Although the resort does its best to be accommodating for late arrivals due to flight delays, they may not be able to wait long enough if there are other guests in the boat. In these cases, special transfers will need to be arranged for guests that arrive late. ✓ Maximum 4 dives per day in various, famous diving sites (Cape Kri, Max Point, Manta Point, Sardine Reef, Mioskon, etc), subject to weather conditions.
" From/to Sorong airport, by A/C car & by speedboat per person/ per way. The restaurant serves a selection of Indonesian and Western dishes. If you have special dietary requirements, please inform us at least 60 days before your arrival to allow us enough time to make necessary arrangements. an entrance fee. Its validity is one (solar) year. The amount of the fee is established by Raja Ampat Government and is subject to change without prior notice. At the present date the amount is Rp.1.000.000 per person (about €80) for international guests; Rp.250.000 per person for Indonesian citizens. Raja Ampat is a remote area with limited access to medical care. Therefore you are advised to bring your medicine with you. If there are pills that you need to take regularly, please bring enough stock for all the days of your stay. If you have any medicine allergies and you need to use special medications in case of sickness, bring these with you as well. Medication for diarrhea is a recommended one for all trips to the tropics as well. Malaria: Malaria is more common in big cities and less of a threat in the resort. You may choose to take preventive medicine, however we strongly recommend that you consult your doctor before using these as they are known to have some side effects. The best way to avoid malaria and all mosquito transmitted diseases is to get protection against mosquito bites. Mosquito repellents are advisable for both direct use on body and for the room. Light, long sleeved clothes are safest and best way to avoid mosquito bites. Most nationalities can get Visa On Arrival for 30 days at the major entry points to Indonesia. To be able to enter Indonesia, your passport needs to be valid for at least 6 months from the date of arrival and you need to have a return ticket. Visa On Arrival costs USD 25 and it is advisable that you carry the exact amount with you. You will be given a pink “arrival/departure” card on the plane. Please fill in these forms and make sure you don’t lose the “departure” card, as immigration police will check it and take it back during your departure. 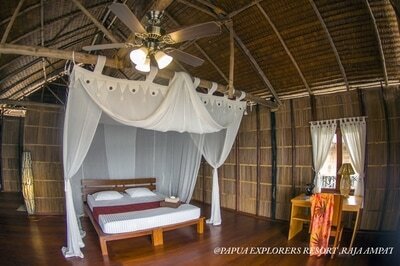 For the address part of this form, please write: Papua Explorers Resort, Raja Ampat. Upon arrival, you need to go to the counter for Visa On Arrival and then proceed to the passport control desks named “Foreigner”. The resorts also need to get another document called the Surat Jalan for you to be able to enter Raja Ampat. Please take 3 copies of your passport and 3 pictures with you.